For Alberto Ascari things took a nose dive when he famously ploughed his Lancia into the Monaco harbour at this event. 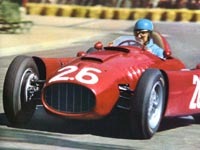 A few days later Alberto got killed at Monza during a test drive in Castellotti's new Ferrari sportscar. His civvies did nothing to protect him. At the end of the season Gianni Lancia handed over his cars to Enzo Ferrari and the Lancia-Ferraris triumphed in the 1956 season. 73.6mm x 73.1mm for a displacement of 2,497cc (or is it 2,489cc?). Ignition by twin Magneti Marelli magnetos. Fours twin-choke, downdraft Solex type 40PII carburetors. Mobilgas racing fuel and Mobiloil lubricants. Engine set at an angle in the chassis. Five speed gearbox in unit with the final drive. Space frame chassis with the engine as a stressed member. Driveshaft to the left of the driver using offset transaxle input gears. Fuel originally carried in sponsons between the wheels, but moved to a fuel tank in the tail by Scuderia Ferrari during the 1956 season. Fuel capacity 200 litres (originally 160 litres). Front suspension: double wishbones, transverse leaf spring with the upper wishbones having a rocker arm extension operating the in-board shock absorbers. Rear suspension: de Dion tube with transverse leaf spring. Estimated horsepower estimated at 260bhp. Cars designated as the D.50A (for ameliorato, 'improved') for the 1956 season. In 1956, new dimensions of 76mm x 68.5mm (2,490cc) used. Suspension modified for 1956, with Houdaille lever-arm shock absorbers replacing the original tubular ones front and rear with an anti-roll bar added to the front suspension. In 1957, dimensions revised to 80mm x 62mm (2,499cc), estimated 285bhp. First testing appearance in January 1954 at Casella Aerodrome. Lancia e Cia in very serious financial troubles in the Summer of 1955, and the Lancia family sold out to an investment group headed by Carlo Presenti and Fiat owner Agnelli. Fiat guaranteed a five-year subsidy of Scuderia Ferrari racing activities. At the 1956 GP de la Republica Argentina at Buenos Aires, Olivier Gendebien drove a Ferrari 555 (chassis 555/4) fitted with a Lancia DS.50 engine. Scuderia Ferrari internal designation for 1957 was the Tipo 801, which first appeared at Siracusa. Officially a private entry since Scuderia Ferrari had officially turned in its competition license to the ACI; however, team manager Amarotti and engineer Bellentani were present along with the usual mechanics from the Scuderia.